“When you want to raise morale, make people feel better about their job, you have to empower them,” Joshua tried again. Weasel words is a concept codified by Lee Thayer Leadership, Thinking, Being, Doing. In the history of this blog, in addition to accountability, we have identified two other weasel words, motivation and holocracy. This entry was posted in Accountability and tagged accountability, authority, empowerment on July 27, 2016 by Tom Foster. I am trying to sort out an argument between one of my foremen and our safety officer. They have two different personalities. My foreman is driven, goal oriented with a knack for getting things done, even if he has to bend a rule or two. My safety officer is conservative, a stickler for policy without much admiration for getting things done. On the face of it, their personalities are suited to the roles we have them in. Until they get in the same room, or in the same meeting, or worse case, on the same job-site. It’s like oil and water. We have done personality testing to confirm what I have described, but they fight like cats. You don’t have a personality conflict, you have an accountability and authority issue. Both roles have goals and objectives. Neither role is the manager of the other, yet they both have to work together. You could stand in and referee every interaction (if you have that kind of time on your hands) or you can get clear about the accountability and authority of each. The foreman, no doubt, has production goals to meet each week and month for the duration of the project. The foreman has the authority, as the manager of his crew, to assign tasks, monitor those tasks and adjust work assignments as time goes by. The safety officer has goals and objectives related to the absence of workplace accidents, the adherence to safety policies and long term, a reduction in work-comp modification factors. The safety officer is in a classic auditor role, accountable for safety, and, also with special authority to delay or stop work in the face of an unsafe work practice. The conflict you witness between your foreman and your safety officer has nothing to do with personality, everything to do with the lack of clarity on your part, as their manager, related to their accountability and authority. The safety officer has the authority because you define it. If you don’t define it, you will get behavior that looks like a personality conflict. This entry was posted in Accountability and tagged accountability, authority, cross-functional relationships on April 4, 2016 by Tom Foster. Who Needs to Be Fired Today? I am a manager, and I understand that I am accountable for the output of my team. My team is accountable for showing up every day with full commitment to do their best. But, I feel stymied by my colleagues, my manager and his colleagues. I know I am accountable, but my authority is constantly under pressure to keep members on my team who should have been terminated long ago. The trouble is, it’s so difficult to get rid of anybody around here. Yet, I am accountable for substandard output. My manager points to HR, HR points to policy, policy points back to me and my hands are tied. It is not unusual for an organization to be fuzzy about hiring and firing practices. Upper management does not trust lower management to make sound decisions, and this lack of clarity creates a malaise of inaction that is allows underperformance to continue, simultaneously debilitating the morale of the rest of the team. Elliott Jaques was quite clear that managerial accountability also requires managerial authority. Organizations underperform because this issue remains unresolved with managers, at all levels, passing the buck. For a manager to be held accountable for the output of the team requires the manager to be given, minimum, veto authority in team member selection. Likewise, that same manager must have authority to de-select an individual from the team. There are two implications. No manager can unilaterally make hiring and firing decisions in a vacuum. There are considerations of budget, work flow, work schedule, capacity. These circumstances create the context of the hiring and firing decisions. The second implication is the role of the manager-once-removed. The concern of upper management about the decision-making of lower management is not without merit, but, for Pete’s sake, get clear about the authority that goes with the accountability. In hiring practice, the manager-once-removed is required to create a slate of qualified candidates for the hiring manager to select from. The manager-once-removed should be well aware of the context of the hire, including budget, work flow, work schedule and capacity planning. In this way, the manager-once-removed can be assured the hire is proper in context and that the hiring manager has a qualified slate to select from. In firing practice, the manager-once-removed is required to be an active coach to the hiring (firing) manager. The hiring (firing) manager may de-select an individual from the team, but terminations from the company require the agreement from the manager-once-removed. Again, the manager-once-removed should be well aware of the context of the de-selection and/or termination related to budget, work flow, work schedule and capacity planning. Most organizations leave this authority fuzzy and suffer the consequences. For a manager to be accountable for the output of the team, that manager must have the minimum veto authority on team selection and authority to de-select after due process. So, why would the manager-once-removed want to get tangled up in this mess? Because the manager-once-removed is accountable for the output of the hiring manager. The manager-once-removed is accountable for the quality of the decision made by the hiring manager. This accountability changes everything, overnight. This entry was posted in Accountability, Hiring Talent and tagged accountability, authority, hiring manager, hiring talent, manager once removed on March 30, 2016 by Tom Foster. This entry was posted in Accountability and tagged accountability, authority, meetings on December 11, 2015 by Tom Foster. Catherine Nibali was chosen as the successor CEO to a company in trouble. 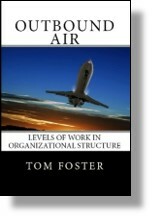 This is the beginning of the next book, sequel to Outbound Air. Find out how Catherine got here. This entry was posted in Accountability, Culture and tagged accountability, authority, culture, Outbound Air on October 12, 2015 by Tom Foster. “And what will your relationship be with each person working on your project team?” Catherine asked. “Okay, and what else?” Catherine asked. This entry was posted in Accountability and tagged accountability, authority, project leader on April 2, 2015 by Tom Foster.